I'm not going to go into much detail here because I don't aspire to be a music writer. 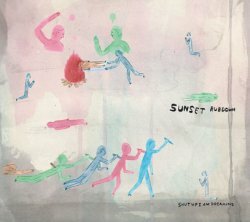 If you're interested in the records mentioned, check out the reviews at Pitchfork, Stylus Magazine, Cokemachineglow, and other music blog sites. With the exception of Grizzly Bear, available directly from Warp Records, and the RIAA artists, everything here is at eMusic. All the lists are in order from top to bottom even when I didn't use numbers. These would be in my Top 10 list, but I'm making a special category for them because they're strange and unique enough to be held apart and above the rest of the Top 10. You might not like them, but they're all fantastic and quite different from anything else you're likely to hear. These two albums are pretty great too, and could have been in my Top 10, but they're distributed by record labels that belong to the Recording Industry Association of America (RIAA). Normally, I prefer to spend my money with companies who aren't forcing digital rights management down our throats, treating customers as criminals, and in the case of Sony, infecting our computers with spyware. But I made an exception for these records. EP's These are too short to really qualify in the Top 10 list, but they're really good. The rest of the list. All of which are very enjoyable, and might be on your Top 10 if you give them a listen. 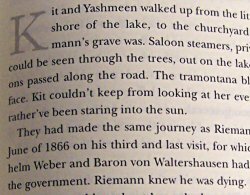 When I started reading Mason & Dixon several years ago I spent the first half looking up all the obscure references, keeping track of all the characters; trying to figure out exactly what Pynchon was saying in the book. Eventually I got tired of this approach and just wanted to finished the damned thing. So I abandoned all my research and read it as I would read Nick Hornby or any of the other books you buy at the airport to get through your flight. But since I never really "got" the second half of the book, I want to re-read it again and catch up on all the things I missed. Since that book, which I finished in 2000, I've read a lot of books with historical context, most recently William T. Vollmann's Europe Central. The Internets (tubes, not trucks, don't 'cha know), especially the Wikipedia, really bring a lot to reading books like this if you have the dedication to look up the historical references and learn the context surrounding the story the author is telling. For example, the Warsaw Riots were mentioned by one of the characters in Europe Central, so I read a little of the history. I also read Antony Beevor's Stalingrad to fill in those gaps in my knowledge. And the Warsaw Riot section of the Wikipedia linked the movie The Pianist (which I'd watched on DVD several years ago) to what I'd been reading. Dmitri Shostakovich is one of the characters in the book, so I downloaded his Seventh Symphony (part of which was written during the siege of Leningrad) and several Shostakovich pieces mentioned in the book. All of these connections were made because I took the time to look away from the pages of the book and fill in the details on my own. And now I have a much fuller understanding of what World War II was like and what the consequences were on the people who lived through it (or didn't, I suppose). I'm currently reading Against the Day. Having a comfortable place to read the book, keep track of all the details, and be able to look stuff up will make getting through my twenty pages a day a lot easier. We've only got one comfortable place to sit in the house, so I'm reading the book on the couch, listening to music on the stereo. My laptop is next to me on the end table with the Wikipedia, an online dictionary and the Pynchon wiki open in Firefox. 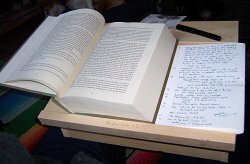 To make it easier to take notes and read a book that weighs as much as a brick, I'm going to build a lap desk. Jefferson used one of his own design so he could write wherever he went, and wrote the majority of the Declaration on it. I've styled mine (with help from a fellow Galoot on the OldTools List) more along the lines of a Shaker lap desk. The photo shows the prototype I built from scrap pine. When I get around to building the real version I'll use some walnut that's been sitting in the garage for six or seven years waiting for the right project. I also thought about what sort of notebook to use while reading. I could make a blank book, but I don't know how many pages I'll really need, so I'll make the notebook a section at a time, and after I've finished the book, bind the sections together. I used six sheets of paper, folded in half, and then sewn once through with linen thread. When the time comes to bind them together, I'll remove the existing thread, punch new holes and bind it. Because the sections are almost completely loose, they're easy to handle on the desk and lay flat for easy writing. I'm currently 60 pages into the book and have filled five pages. If I keep up that pace, I'll have a 90 page notebook when I'm finished (four sections). If you're thinking about doing this for your reading, keep in mind that you can't use normal paper for this because the grain of regular paper is going the wrong direction (up and down, or long-grain). You need short-grain paper in order to fold it in half and get pages that lay properly and won't curl. Broken Social Scene and Swan Lake are cued up on iTunes, so it's time to get to my twenty pages. Last time I learned about the Haymarket Riot and Maxwell's Equations. I wonder what I'll learn today? 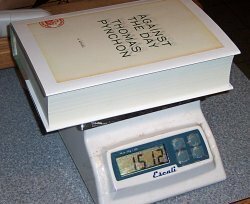 My copy of Thomas Pynchon's Against the Day showed up today, two days earlier than Amazon promised (I actually tried to buy it in town, but the local independent bookseller said he didn't think anyone would buy it (gasp! ), and Barnes and Noble had 15 "on order" but none on the shelf). I've been looking forward to it for a couple months after catching the accidental Amazon blurb Pynchon wrote. Since then, I joined the Pynchon-L mailing list and they've fueled the fires of my interest in the new book, and Pynchon in general. I never managed to finish his masterwork, Gravity's Rainbow, but I really enjoyed Mason & Dixon, to the point that I saddled several family members with it. "Happy birthday! Here's a huge, complex, difficult book for you to struggle with . . ."
I plan on reading it fairly deliberately, around 20 pages a day, hopefully. That way I can finish it by the time the P-Listers have an organized re-reading. If you're contemplating the book, check out the Pynchon wiki, which should help flush out any references that aren't clear at first. They've got a "spoiler-free" annotations by page section that should be really helpful. Tom Waits on the stereo. Time to get started. Yesterday it was cold enough on campus that we left Piper and Nika at home. They are both used to getting a walk around 10 AM, so I drove home, had lunch and let them out. When I got back to my office I remembered I'd left my laptop open (normally I put it to sleep when I'm at work or during the night). A quick Internet search and I found a command-line application that lets you take pictures using the camera that is built-in on new MacBook and MacBook Pro computers. I used ssh to get to the laptop from work, downloaded the application, ran it, and then copied the image back using scp. I expected to either see nothing but the cushion of the couch, or maybe our cat Ivan sitting on the back of the couch watching birds. 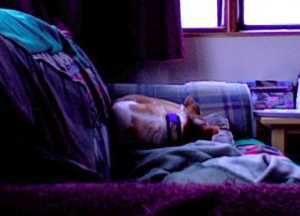 Instead, it's Piper sleeping on the couch! She's not normally allowed up there, and whenever we've left her home, she's sleeping on her bed on the floor when we arrive. She's a sneaky one. 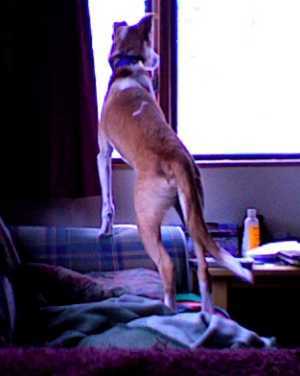 A few minutes later I tried again, snapping the image of her actually standing on the couch looking out the window. When I got home later, I discovered we had a visit from some prosetylizing christians and that's why she was looking out there. 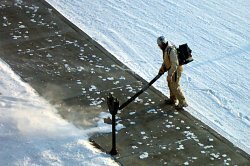 Recently, I had the same surprise on campus when Facilities Services at UAF started equipping their sidewalk cleaners with the same devices, except now they're using them to blow snow. I don't have the data to perform an economic analysis of this decision, but I guarantee that when you add in the externalities of noise and air pollution, engine maintenance, the damage done to cars when they blow gravel into them, and the impact of burning fossil fuels on the global climate, a shovel starts looking pretty cheap. They also don't do a very good job because they can't remove snow that's been packed down at all. Check out all the footprints in the image. I can't help but wonder, once again, if some problems are better solved with less modern technology. 1These figures come from a variety of sources, referenced on this site. It's a biased site, but I trust the cited sources.